"Nos Fiançailles, France/Portugal" is the name of the album recently released where Tony Carreira duets with some former French Eurovision participants such as Serge Lama, Gérard Lenorman, Natasha St-Pier and Anggun. It also includes a cover of Marie Myriam’s entry L’oiseau Et L’enfant. Tony Carreira is one of the most popular artists in Portugal. In his 25-year career he has released seventeen albums and he has sold more than three million albums worldwide. 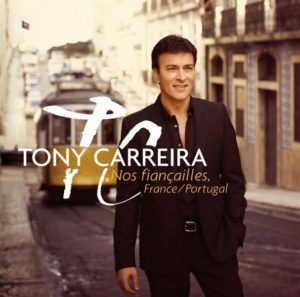 Nos Fiançailles, France/Portugal is an album where Tony pays tribute to French music and the songs that have inspired him at the beginning of his successful career and he has asked some of the most popular French artists to collaborate with him on this project. Among the gems one can find in this album is a version of the song La Neige Au Sahara, which was released in 1997 by Anggun (France 2012) on her first album. We can also listen to Tony singing Une Île in a duet with Serge Lama (France 1971) or a version of Sous Le Vent, the song made popular by Garou and Céline Dion (Switzerland 1988) sung with Natasha St-Pier (France 2001). Another former Eurovision star who collaborates on this album is Gérard Lenorman (France 1988) singing Michèle. Dider Barbelivien, the author of Il Me Donne Rendez-Vous, the French Eurovision entry from 1995, is also among the French artists who collaborated on this album which also contains a version of a the Eurovision entry, L’oiseau Et L’enfant, performed by Marie Myriam at the 1977 Eurovision Song Contest. Tony Carreira is currently on a world tour and he will be performing in Paris at the Olympia from the 8th to the 10th of March and the 12th of April at the Palais des Sports where most likely he will be accompanied by some of the artists who have collaborated on this project. Below you can find a video of the recording of the album and also the official videoclip of the song Sous Le Vent recorded alongside Natasha St-Pier.